” Today in the town of David a Savior has been born to you; he is the Messiah, the Lord. Many will wonder why Jesus is the reason for the Christians today on Good Friday??? What JESUS ACTUALLY PAID?? ?WHO WAS HE??? ?IS HE REAL??? ?WELL I WANT TO EXPERIENCE????? If these questions come in your mind you are surely seeking for peace in your life! today I encourage you to read the Bible, understand who is Jesus Christ of Nazareth! Good Friday is importantly believed to give peace in every men’s life. This peace not not meant like the word give, like just for an example you would want to eat some delicious food at some time like say Chinese, and later you would still feel unsatisfied and feel hungry to eat some else. Also for instance you will be lying weak some day thinking for many things and be without peace and you actually don’t know what to do.?? ?You search for peace, you search for Blessings that would give complete satisfaction in your heart, and for this reason God sent Jesus Christ. God knew the world needs Him on earth and how that would be possible???? Only when a Holy person would be born without blemish, so he went Jesus once for all, to give three things for every human who believes that He is the son of God. -SALVATION – To redeem us from our sin, Jesus paid on the Cross, now we don’t need to give any sacrifices and offering that are artificial. ***God needs our thanks giving and praise. -PEACE – He gives peace to all who believes in Him, for he is peace sent by God, His only Son. ***Not like buying things and superstitious articulate to fill the small gap of tensions, PEACE FROM GOD IS FOREVER. -EBTERNAL LIFE IN HEAVEN – He is the way towards Heaven, after we die we go to heaven…A place where there is resting, siting and being present front of the Almighty God of Heaven and earth. ***HEAVEN IS REAL SO IS HELL, YOU CAN GOOGLE IT. Google will not give you the experience but BIBLE WILL. DO Read!!!! 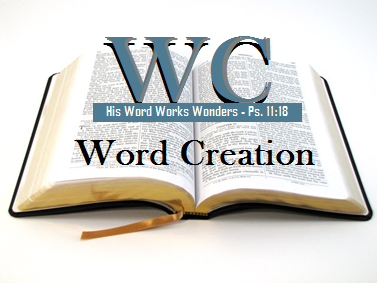 You can connect on http://www.wordcreation.org for Prayers, daily food and message, Voice of Heaven passes from you to all your family members. Why do we call Good Friday “good,” when it is such a dark and bleak event commemorating a day of suffering and death for Jesus? For Christians, Good Friday is a crucial day of the year because it celebrates what we believe to be the most momentous weekend in the history of the world. Ever since Jesus died and was raised, Christians have proclaimed the cross and resurrection of Jesus to be the decisive turning point for all creation. Apostle Paul considered it to be “of first importance” that Jesus died for our sins, was buried, and was raised to life on the third day, all in accordance with what God had promised all along in the Scriptures (1 Corinthians 15:3). The cross is where we see the convergence of great suffering and God’s forgiveness. Psalms 85:10 sings of a day when “righteousness and peace” will “kiss each other.” The cross of Jesus is where that occurred, where God’s demands, his righteousness, coincided with his mercy. We receive divine forgiveness, mercy, and peace because Jesus willingly took our divine punishment, the result of God’s righteousness against sin. “For the joy set before him” (Hebrews 12:2) Jesus endured the cross on Good Friday, knowing it led to his resurrection, our salvation, and the beginning of God’s reign of righteousness and peace. Good Friday marks the day when wrath and mercy met at the cross. That’s why Good Friday is so Good. This beautiful morning of another beautiful day , I pray every power that says you will not succeed shall be disappointed and they will meet their end in the lake of fire. The yoke of failure is destroyed in your life by the reason of the anointing, and failure at the edge of breakthrough in your life is terminated. I pray, that the spirit of near-success, failure cycle, repeated cycle, ancestral cycle to pack their load and get out of your life from today you are no longer in league with the failures and the downtrodden in Jesus name Amen. Good morning, have a blessed day ahead. When things seems to be impossible, impregnable, insurmountable and when you go through some difficult situations where you need to take some important decisions in life, I encourage you to look to God, He is our answer, Helper, Provider, Healer, Strength, Hope, Shield, Strong Tower, Deliverer, Redeemer, Miracle Worker …… hold on to God who has a purpose and destiny for you. Build your trust, faith and draw strength from Creator. He is all sufficient and all powerful who will turn everything around for His glory. It’s a Kairos time for you step out in Faith. Amen!!! This beautiful morning of another beautiful day, As you have been waited for a long time for the opportunity that will come to your way. I pray God will create the opportunity that will get you to your land where milk & honey flows. I pray that God will remove all the problems you have been encountering and give you perfect peace that surpasses all understanding in Jesus name Amen. Good morning have a blessed day ahead. Joshua 1:9 Be strong & courageous. Do not be terrified or discouraged, for the LORD your God will be with you wherever you go. This beautiful morning of another beautiful day, pray God will give you new song and reason to dance in every area of your life (Psalms 30:11-12), God will defend and deliver you from the lies of the enemy and there shall be divine opportunities and open doors of opportunities for you. And the crowd gathered singing !!! And when He entered Jerusalem people saw him and blessed him. He came to conquer the world, it was not easy for him, but because he remembered our life made in the image of God and how precious we are, He decided to complete the plan of Heaven for us so God’s Glory would manifest over us. And surely because of this day- The Glory of God passes from one generation to another. And there is nothing like this in History that can be compared. I am blessed to share this Testimony of Jesus Christ of Nazareth that He lives today to save you and me. You can surely read more in the Bible, if you read, I guarantee you life of eternity and peace. God will open up the doors of Heaven and shower his might and glory in your life. YOU ARE ALREADY BLESSED AS YOU ARE READING THIS PRECIOUS AND POWERFUL MESSAGE. This beautiful morning of another beautiful day, I pray that, God, you who have been neglected for good number of years by your family, friends, your helpers from far and near they suppose to be your benefactor know that the Almighty is on your side . This beautiful morning of another beautiful day, I pray God will remember you for good and intervene in all your situation. The mercy of GOD will locate you and bring you out of every distress, you will never be lonely in your hours of need and you will not become dejected, the out stretched arm of God will comfort you and strengthen you forever in Jesus name Amen. Psalm 25:13 He himself shall dwell in prosperity, And his descendants shall inherit the earth. This beautiful morning of another beautiful day, I pray, that God to destroy every power that delay the fulfillment of your dream, any representative of evil that was assigned to trouble your purpose, treating your existence be wipe out in your life by fire by thunder, every promises of the living word of God be made manifest in every areas of your life. The Lord will open the doors of opportunity that no man can shut against you (Isaiah 22:22), every ancient gate that lead to your breakthrough be opened and your doors of favour be open and remained open (Psalm 24:9) in Jesus Mighty name. Good morning have a blessed day ahead. Isaiah 41: 10 Fear thou not; for I am with thee: be not dismayed; for I am thy God: I will strengthen thee; yea, I will help thee; yea, I will uphold thee with the right hand of my righteousness.